Ever since it first arrived on the scene, the Mustang has been Ford’s halo car and a very successful model for the blue oval, with 9 million units sold in the last 50 years. There’s no denying the mystique that is associated with the original pony car but, with sports car sales on a downward trend, Ford had to evolve its all-American icon and take it in a new direction to broaden its appeal and attract a younger audience here in North America and worldwide. The all-new sixth-generation Mustang shares the classic proportions of the previous models. It showcases the traditional design elements that have been associated with the car since its early days. The 2015 Mustang still features a long hood, sloping fastback roofline and short rear deck, but there is also a more modern touch to the overall design, even though it will never be mistaken for anything other than a Mustang. What’s clearly over though is the low-tech approach for the car’s chassis. Gone is the antiquated live rear axle that was inexpensive to produce but only well suited for drag racing. In a seismic shift, Ford has ushered the 2015 Mustang into the modern age by equipping it with an all-new independent rear suspension deemed essential to the car’s acceptance by European buyers. A 3.7-litre V6 with 300 horsepower and 280 pounds-feet of torque still powers the base model and the GT gets the 5.0-litre “Coyote” V8 now developing 435 horsepower and an even 400 pounds-feet of torque. But the new car can also be ordered with a 2.3-litre inline four-cylinder EcoBoost engine fitted with a twin-scroll Honeywell turbocharger good for 310 horsepower and 320 pounds-feet of torque, which will serve to bridge the gap between the V6 and V8 engines. Driving the new Mustang on mountain roads around the Los Angeles area, three things became quickly apparent. First and foremost, that new rear suspension pays massive dividends in the ride and handling department, both in the turbocharged Mustang as well as the GT. The new car does not dive as much under braking, the steering is always sharp when turning into a corner and the feed-back from the steering wheel is very good, especially when “Sport” mode is selected. Mid-corner, the new car soaks up bumps and dips in the road with poise and does not pitch fore and aft like the old car did. The turbocharged four-cylinder Mustang is easier to hustle in quick transitions from one corner to the next, as it is lighter than the V8-powered GT, and the car takes a nice set through the curves while still leaning somewhat noticeably. The GT may be a little slower through tight switchbacks, but that V8 grunt makes up for it on the straights and the Getrag six-speed manual gearbox is easy to shift quickly, which adds to the driving experience. Both the GT and EcoBoost Mustang can also be ordered with a six-speed automatic featuring paddle shifters and rev-matching on downshifts, but this transmission did not feel as quick or as slick as the double-clutch gearboxes featured on German sports cars. The sound quality of the V8 will also be a bit of a disappointment if you’ve recently driven an F-Type Jaguar, as the Mustang does not make all the joyous sounds that are now typical of the British sports car. The second thing we noticed about the new Mustang is how much it weighs. With the EcoBoost and GT models tipping the scales at over 3500 and 3700 pounds respectively, the new Mustang is no featherweight. And since weight is the enemy of performance, both in a straight line and through corners, we were left wondering about what could have been if Ford engineers had kept a closer eye on the scales during the car’s development. The third thing we noticed while driving the new Mustang is how much more refined the car is. The chassis feels noticeably stiffer, body motions are well controlled, the cabin is well insulated and the level of fit and finish is a welcome improvement over the outgoing model. These improvements are sure to make the new Mustang easier to live with in everyday driving conditions. With tilt and telescoping steering, it is easy to find the ideal driving position, forward visibility is very good, the swithchgear is well laid out and features an aluminium-look, and the overall quality of the materials used in the cabin feels a cut above previous models. Looking at the speedometer, you can’t help but smile or laugh when you see the words “Ground Speed” painted on the dial. It’s a nice touch. Thinking about bringing friends along for a ride? Better make it a short one. The backseat is only suitable for kids. Infotainment comes by way of systems like SYNC and MyFord Touch and there is an available Shaker Pro audio system. The 2015 Mustang also features a standard rearview camera as well as a USB port. The side mirrors project a pony outline on the ground at night, which is another nice touch. 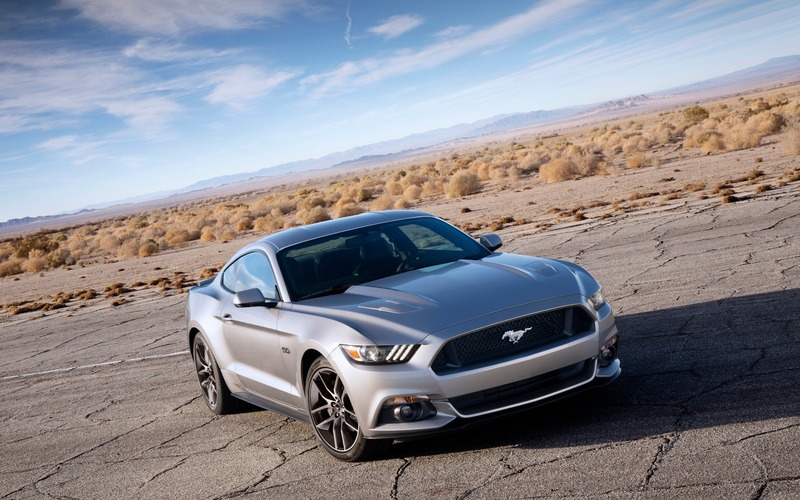 The 2015 Mustang Coupe will be on sale this fall, with convertible models following a little bit later. The V6 Coupe will retail for $24,299, the EcoBoost and EcoBoost Premium will cost $27,999 and $33,499 respectively, while the GT and GT Premium will go for $36,999 and $42,999 respectively. Ford will also build 1964 units of the Mustang GT Coupe 50 Year Limited Edition, which will be equipped with nearly every available option. Customers will only have to make a choice between a manual gearbox or an automatic transmission and between two colors: Kona Blue and Wimbledon White. The price of this special model is set at $52,899. Spotlight on 2015 Ford Mustang: We're Driving It This Week! News Saleen S302 Black Label: Hellcat-who?